They will be singing the greatest rock, soul and blues hits from 70s and 80s including . Tina Turner,Donna Summers, Etta James, Janis Joplin, Aretha Franklin, and Stevie Wonder. 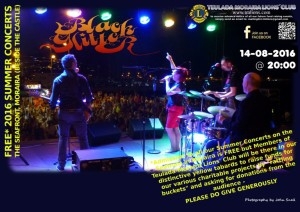 *Admission to all our Summer Concerts in Moraira is free but Teulada-Moraira Lions´ Club Members will be there in our distinctive yellow tabards to raise funds for our community work and various charitable projects by “rattling buckets” and asking for donations from the audience – PLEASE DO GIVE GENEROUSLY.